The new ‘Rift-To-Go’ item allows plays to create a portal open up in the sky, allowing players to redeploy their and land anywhere they want. The popular game Fortnite Battle Royale has got a new update that brings a number of bug fixes, changes and new additions to the game. The new update bumps the game up the v5.30. The most notable of the new additions is a new item called the Rift-To-Go. 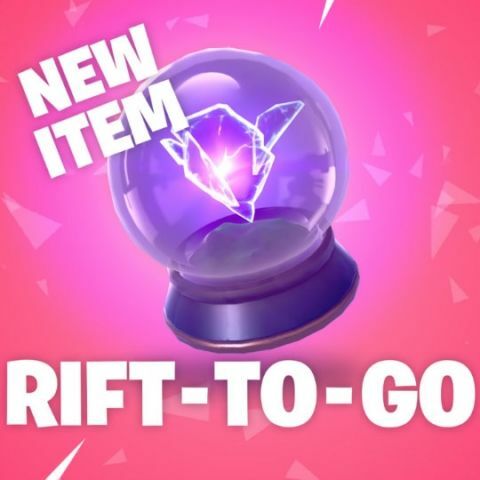 The item looks like a snowglobe the lets players create a portal to the sky where they can redeploy their parachute and land in a new spot. These rifts can also be opened in mid air and linger for a few seconds. Allowing other players (including teammates and enemies) to follow. This opens up plenty of opportunity for escaping as well as gaining a tactical advantage. There’s also a new limited-time mode called Score Royale which challenges players to rack up points by successfully performing certain tasks. There is also a new weapon called the Bundlebuss Assault Rifle. The update also bring a new Horde Weekly Challenge. Completing the challenge will earn players a legendary reward. The complete patch notes can be read here. The update also allows users to watch the winning video of the Blockbuster contest at Riskky Reels. The contest asked users to create a short video within Fortnite. However, trying to watch a movie in the middle of a firefight is not advisable. So you can watch the video below if you want. Besides the listed changes, Epic games has also added a number of new features that have not been listed in the patch notes. One of the most notable being that the Tomato Town section of the map is now called Tomato Temple, with a pyramid replacing the old restaurant. Reddit user, Flqmingg has also spotted a new feature that lets players thank the bus driver before jumping off. The lower left corner of the screen will show “[Player name] has thanked the bus driver.” The new feature doesn’t seem to affect the gameplay in anyway, but seems like the polite thing to do.